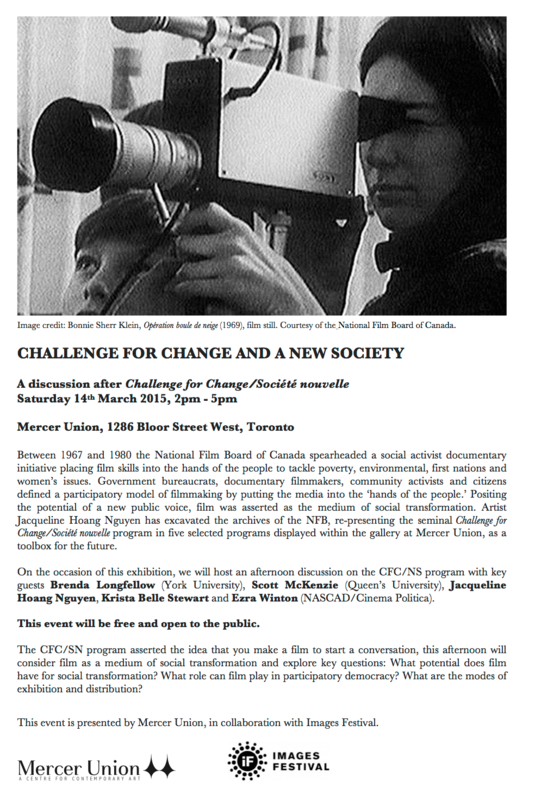 Challenge for Change/Société nouvelle was a program launched by the National Film Board of Canada in the late sixties that facilitated the production of around 200 social documentaries known for their inclusion of subjects in the production process and their uncompromising critiques of government programs. In 2010 I co-edited a book on CFC/SN with Tom Waugh and Michael Brendan Baker (check out more on this great collection here) and it seems those three years of hard work producing that door-stopper are still turning up new offers to talk about the program. The newest talk will take place on Saturday, March 14th in Toronto, where I will discuss alternative exhibition/distribution models as they relate to social justice documentary work. At the event, which is entitled Challenge for Change and a New Society, I’ll be joined by some stellar scholars (many of whom also contributed to the book) and I’m honoured to be invited. Here’s a link to the social media event page.